​Let's do it again June 8, 2019! The Chippewa Triathlon is a unique event that combines canoeing, biking, and running, all through the Chippewa National Forest in Cass Lake, Minnesota. The course follows the centuries-old "Pike Bay Connection". Approximate leg-Distances: 15-mile canoe, 29-mile mountain bike, 5-mile trail run. Final course set right before the race based on wind, recent and forecasted weather, etc. The Chippewa Triathlon is not solely a competitive event; organizers emphasize its value as a personal challenge and an opportunity to improve one's fitness level through preparatory training. And, you get to see some beautiful country! The FINE PRINT: In the event we have inclement weather, the event may be delayed or altered. It has never been postponed, but if that happened, the back up day would be the following day, which would eliminate the separate Sunday canoe race. Looking for a warm up event? Find The Root River Tri. They use canoes and kayaks too! 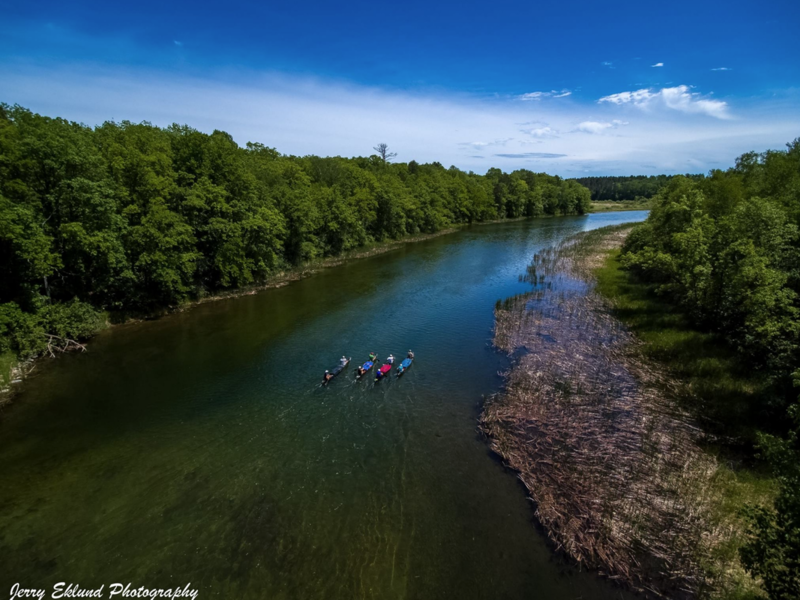 ​ SUNDAY : Canoe Race: June 9, 2019. Jerry Eklund Photo (above) from 2017 event where Krista Matison and Monica Hansmeyer won the carbon fiber paddles as door prizes. Rick Lorenzen won the Barry Babcock book, "Teachers in the Forest." NEW!! 2019!! the Sunday canoe race will likely be held with the Omega Access (same as canoe/bike transition in triathlon) as a base. There are 3 rivers all within striking distance of the access. The canoe folks will be out doing some testing when the ice is gone. Please arrive with a clean watercraft at the start line. We will have an inspector on site and things will go quicker if all boats are clean!! CANOE RACE: SUNDAY FOLLOWING TRI!! Canoe race to be held the day after the triathlon. Pro and cruisers* in "Pro" class, all other canoes considered "stock." ​Entry Friday evening $15/per paddler or Sunday morning starting at 10 a.m. $20/per paddler. Racing at 11. *Cruiser class will be created if we can get 3 or more cruisers. "Over 65 pound canoe" class created with 3 or more also. Participants must weigh their own canoe in advance. A classic example of over 65 would be a 17' royalex "Old Town". PHOTOS BELOW ARE FROM THE TRIATHLON COURSE. **If you watch the video, notice all the life jackets!! 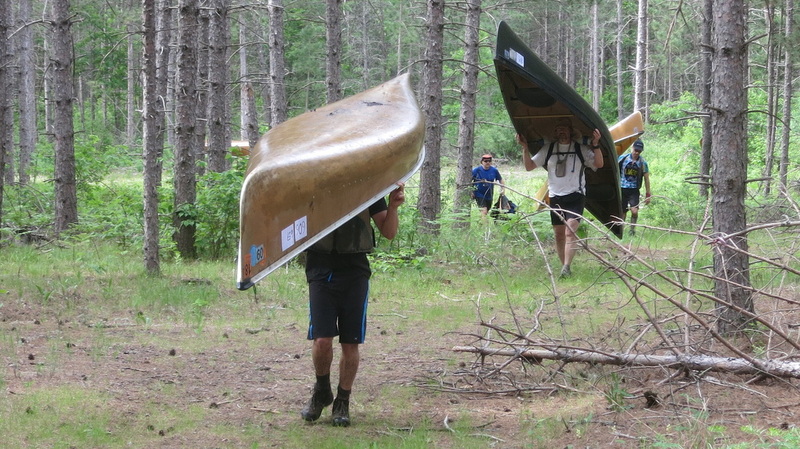 Once again a reminder that PFDs must be worn from the start of the canoe leg until the first portage at a minimum. Of course wearing a pfd is always a good idea. Coming out of the bogwalk on Little Moss Lake. Looking for team members? For example, are you a biker but not a paddler? Is your team short a runner? Send an email to chippewatriathlon@live.com and we'll try to put you in touch with others that might help create a team. LOOKING: Currently have one veteran of a couple Chippewa Triathlons who lives in the north metro who is looking for a canoe partner for doubles division. Drop us a line if interested. Thanks for visiting the Chippewa Triathlon Website! We hope to see you in June !